How do you like your Christmas cake? The tradition began in the 16th century with a feast of porridge to line the stomach after a day's fasting. Spices, fruit and honey were later added to enhance the flavour and this was the early beginnings of the Christmas pudding. Either a plum pudding or fruit pudding was made depending on the ingredients available. Later, wealthier families would add butter and eggs to the mixture and baked the mixture as a cake. Only larger homes had an oven to enjoy this delight! The first Christmas cakes were traditionally eaten on the Twelfth Night and known as Twelfth Night cake. They would have been a simple fruit cake. In 1640, Oliver Cromwell banned the cakes and mince pies too, saying they were too indulgent! By the end of the 17th century, the cake revived and confectioners made them more elaborate decorating with snow scenes. They were eaten throughout the festive season and shared with visitors over the full 12 days of Christmas, and so the Christmas cake tradition began. By the 18th century, boiled plum puddings and fruit puddings were sent to relatives living in the new world Colonies. The boiled puddings kept better than cakes, and it took several months for the puddings to reach their destination by ship to Canada, Australia and America. Americans were receiving Christmas cakes from all parts of Europe and a German baker living in America, began making Christmas cakes with more exotic fruits grown in America and these in turn were sent back to relatives living in Europe! To this day, these more exotic Christmas cakes are the most popular. We all have our favourite recipe for a deliciously rich Christmas cake, but the secret to keeping it moist and enhancing the flavour for up to a year is in the alcohol used to soak the fruit. 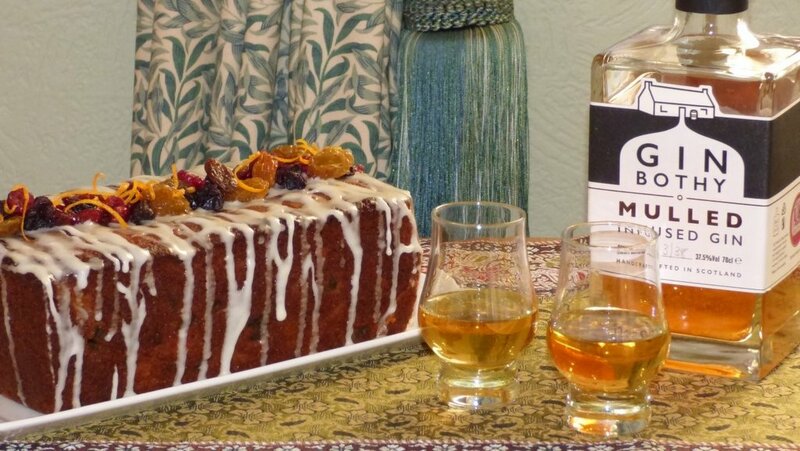 Typically you will soak your fruit in fine Scottish whisky and regularly feed the cake after baking by spooning over a few teaspoons several times over the following weeks, before covering with marzipan and icing. Brandy, Port, Rum or Sherry will each add their own distinctive flavour. A good rich Christmas cake is at its best around three months after baking. Inspired by Mrs Bridges Christmas Marmalade, Lynne at Auld Post Office B&B baked this Zesty Marmalade Loaf Cake and soaked dried cranberries in Mulled Wine for two days before adding to the cake mix. The glace icing is made with a couple of teaspoons of mulled gin from the Gin Bothy giving a lovely juniper flavour. Plumped fruit is key to a rich moist cake, our member Naomi at Garvally House Guest House shares her tip to leave the fruit for several days soaking up all the alcohol before gently stirring into the cake mixture. Preheat the oven to 180C/gas mark 4 and put a baking sheet in at the same time. 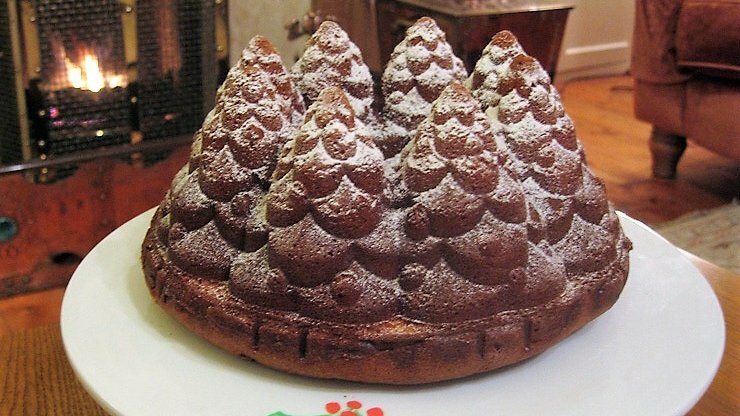 Butter the fir-tree shaped bundt tin (2.5-litres). Cream together the butter and sugar in a mixing bowl until light and fluffy. Place the tin on the preheated baking sheet in the oven and cook for 45-60 minutes until well risen and golden. After 45 minutes, push a skewer into the centre of the cake. If it comes out clean, the cake is cooked. Let it sit out of the oven for 15 minutes. Gently pull away the edges of the cake from the tin with your fingers, then turn out the cake. 1lb (450g) Cooking Apples - peeled, chopped, cooked to a soft pulp and cooled. Combine all the above ingredients in a large mixing bowl and cover with cling film. Leave to stand for 24/36 hours stirring occasionally. Spoon into clean sterilised jars or Kilner jars, seal and store in a cool place to mature for at least 2 months before using so make it nice and early. Rub the butter into the flour till it resemble fine crumbs, add the icing sugar, and then bind it all together with juice. Knead lightly then roll out until about 2mm thick, cut out 9cm rounds with a fluted cutter. Line a 12 hole muffin tin with the rounds, roll the remaining pastry to make stars or rounds for the lids. From all of us here at Scotland's Best B&B's, we'd like to wish you all a very Merry Christmas and happy Christmas baking too.